Startup India campaign is an effective action plan which has intent to promote bank financing for start-up ventures to increase entrepreneurship and encourage start-ups with jobs creation. The campaign was first declared by Prime Minister Narendra Modi in his 15 August, address from the Red Fort. It is dedicated on to restrict role of States in policy domain and to get rid of "license raj" and interruptions like in land permissions, foreign investment proposal, environmental clearances. It was organized by Department of Industrial Policy and Promotion (DIPP). Narendra Modi in his speech recognized that Indians have ideas and capability, all the need is a little push. "Start Up India" is a revolutionary scheme that has been started to help the people who wish to start their own business. These people have ideas and capability, so the government will give them support to make sure they can implement their ideas and grow. Success of this scheme will eventually make India, a better economy and a strong nation. A start-up is an entity that is headquartered in India which was opened less than five years ago and have an annual turnover less than ₹25 crore (US$3.7 million). The government has already launched PMMY, the MUDRA Bank, a new institution set up for development and refinancing activities relating to micro units with a refinance Fund of₹200 billion (US$3.0 billion). The Standup India initiative is also intended to encourage entrepreneurship among SCs/STs, women communities. Many professionals stated that Startup India is a flagship initiative of the Government of India to develop a strong eco-system for fostering innovation and Startups in the country that will drive sustainable economic progress and generate huge employment opportunities. The Government through this initiative aims to empower Startups to grow through modernisation and design. To accomplish the objectives of the initiative, Government of India has declared this Action Plan that addresses all aspects of the Startup ecosystem. With this Action Plan the Government hopes to quicken spreading of the Startup movement. From existing tier 1 cities to tier 2 and tier 3 cities including semi-urban and rural areas. On 16 January 2016, this campaign was launched by the finance minister Arun Jaitley. The Ministry of Human Resource Development and the Department of Science and Technology have agreed to partner in an initiative to set up over 75 such startup support hubs in the National Institutes of Technology (NITs), the Indian Institutes of Information Technology (IIITs), the Indian Institutes of Science Education and Research (IISERs) and National Institutes of Pharmaceutical Education and Research (NIPERs). The Reserve Bank of India supposed that it will take steps to help expand the 'ease of doing businesses in the country and contribute to an ecosystem that is favourable for the progress of start-up businesses. Under the scheme, a group of start-ups will recognise an MOU with the esteemed institutions and will also establish the start-up centres in the campus. NIT-Silchar (The National Institute of Technology, Silchar) is one of the institutions of the country to have joined the program. IIT Madras is also associated with this campaign. The institution has been effectively managing seven research parks that has incubated many start-up. Many entrepreneurs were enthusiastic by the declarations made by Prime Minister Narendra Modi as part of the Startup India Action Plan. There is no doubt that the measures were significant. - Five years must not have elapsed from the date of incorporation/registration. - Annual turnover (as defined in the Companies Act, 2013) in any preceding financial year must not exceed Rs. 25 crore. - Startup must be working towards innovation, development, deployment or commercialisation of new products, processes or services driven by technology or intellectual property. A significantly improved existing product or service or process that will create or add value for customers or workflow. Products or services or processes with no or limited incremental value for customers or workflow. -The Startup must not be formed by splitting up, or reconstruction, of a business already in existence. - E-registration will be done. 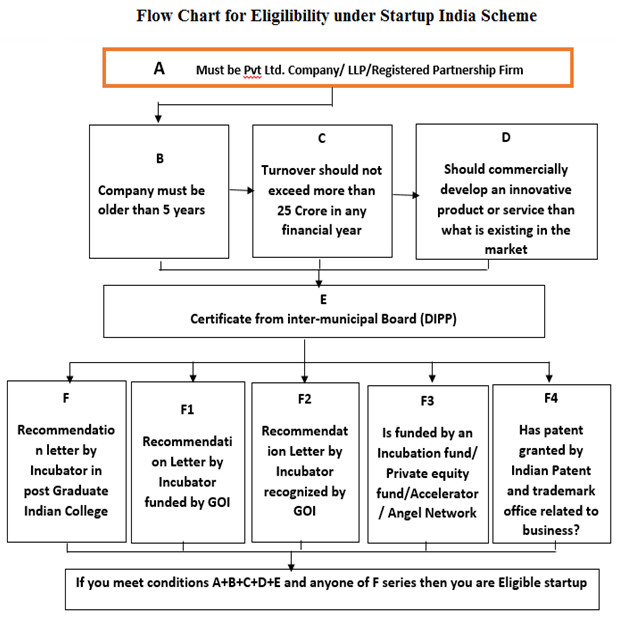 The application forms for start-up India will be made available in April 2016. - A self-certification system will be launched. - A dedicated web portal and mobile app will be developed. - Arrangement of self-certificate based compliance. - No inspection during the first 3 years. - 80 percent reduction in the application fee of start-up patent. - Inclusion of Credit Guarantee Fund. - Relaxation in Income Tax for first three year. - Special Arrangement for Female applicants. - Introduction of Atal Innovation Mission. Innovation courses will be started for the students. There are numerous ways by which start up projects are funded. Business persons can start by looking for angel investors for their startup. Angel investors are fundamentally successful entrepreneurs who have made their fortune in the business and are now looking to invest their money back into startup businesses. Whether it's Facebook, Google or Twitter, all these famous businesses have had angel investors in the past. Angel investors bring more than just money to the startups. They come with a bank of connections and advice which can be very helpful to the startup. Some of the prime Angel networks that link entrepreneurs to investors are Investors Circle, Golden Seeds and Tech Coast Angels. Angel investors can indeed prove to be the Angels for startups. Bank Financing: For start-up India projects, Loans from banks and NBFCs help finance the purchase of inventory and equipment, besides securing operating capital and funds for expansion. More importantly, unlike a VC or angel, which have an equity stake, banks do not seek ownership in venture. This is an effectual way to raise money for startup projects. When taking a banking loan, Person's banker may demand that people have their loan agreement guaranteed by the Small Business Association (SBA). Once the agreement is guaranteed by the SBA, the loan is approved. The SBA is essentially a government agency which guarantees up to eighty percent of the value of the loan for applicants. Only candidates who meet their criteria are guaranteed by the association. Candidates who do not want to go the SBA way, they can also use some other form of security such as home etc. to get loan approved. Business Partner: Another way for funding of start-up projects is through business partner. If candidate has innovative idea about business but he has not enough funds to invest in business then it is wise approach to share with partner of friends and get funding. Many of the leading businesses have received funding from a co-founder. While selecting a business partner, candidates must be careful about certain points. Family and Friends: Some times to start business, candidates seek financial assistance from family and friends. They can loan you money on flexible and mutually agreed terms and conditions. Crowd funding as a means to raise money for startups is still in its primary stages. It is popular with the young entrepreneurs. Crowd funding entails receiving funding from the crowd. In this, the public makes use of their own personal funds to fund their startup idea. Candidates just need to put their idea on a crowd funding idea and people can then choose how much money they want to give to particular idea. Many of the crowd funding sites work on a reward based model where people who agree to invest in a particular business idea are given a reward such as the product that is going to be produced. Some famous crowd funding sites include Fundable, Indiegogo and Kicstarter. Candidates can also raise funds for their start up projects through Venture Capitalists. Venture Capitalists are people who invest in early stage businesses that have a high potential to grow in future. They usually receive equity in the startup business in return for funding it. However, nowadays the trend involves demanding a mixture of debt financing and equity. This kind of funding for projects is new and recently become popular. It has become prevalent because of its extraordinary success with Y Combinator Startups. Yuri Miller and SV Angel have offered $150,000 in convertible debt to every Y Combinator Startup. A convertible note by an investor converts the debt to equity in sometime in the future. This conversion is at a discount to the next funding round that the business raises and has a cap, which means if the business is successful in raising a huge round, the debt investors have protected themselves from getting diluted. In Convertible debt, you don't have to set a valuation. This is taken care in the next round of financing. It helps to keep the costs lower as it requires less paperwork. Second Mortgage: Second mortgage is also a good option for raising money for candidate's startup projects. Business person who want to establish start up projects can use as a temporary measure between getting their company started and obtaining other financing such as getting bank loan approved. Most of the credit cards have interest rates as high as 10-20%, therefore they are not considered a good source of loan term capital. Many capitalists in the past have used credit cards as a source of money for their businesses when they had no other option. Even Google Company was funded by credit cards by its founders in the mid 1990s. Business persons can even get their startup hatched in incubators in India such as Microsoft Ventures (Bangalore), Startup Village (Kerala), IAN Incubator (Delhi), CIIE, IIM-Ahmedabad or global incubators like 500Startups, TechStars or Y-Combinator. These incubators offer more than just money to the startups. They even provide the startup with the much needed guidance and mentorship along with the money. The startups get to be a part of a massive network of successful entrepreneurs that helps them in getting in touch with potential customers and partners. At the end of the program, the startups are provided with an opportunity to present their ideas in front of venture capitalists and angel investors. Startup campaign is appreciated by people. According to news report, 'Start-up India' initiative help start-ups and catalyse entrepreneurship. Start-ups and entrepreneurship are critical to India's efforts to restart private investment into the economy, in the face of risk aversion, stalled or slow investments from corporate India. Many critics are concerned with this scheme and stated that Start-ups in India have two significant obstacles. One is government apathy, corruption and a complex approvals process. Other is the power of entrenched corporates, to oppose or kill start-ups which challenge them. Primarily, India was reflected as the market for offering cheap labour to the world and for export of Indian services in the field of information technology. Due to this India has perceived low product development and modernisation in the past. Recently, it is observed that Tech startups are prominent in the growth of startup period and it is ready to increase revenue generated by IT-BPM sector by almost 12-14 per cent for the current fiscal year as well. It is expected that the e-commerce market of India will grow by more than 50% within the next five years. India witnessed the largest infusion of capital from abroad through venture capital funds in the year 2014 in the original startups. After the initiation of new government in the centre, an optimistic view has been developed around the growth of Indian economy. Business reports have indicated that startups are thriving in India not only in the field of internet but in various other fields as well. Educational tech startups are a new area among various investors since it is predicted that the complete educational system will be digitized in the near future. Likewise, startups are also observing big data for analytics, healthcare, beauty and fitness, biotechnology and other areas as well. Several startups have also ventured into food delivery service as well. Examples include Mast Kalandar in Mumbai and Bangalore, Eatlo, Freshmenu, TinyOwl etc. These have created employment opportunities in huge level for unorganized sections of the society in the form of delivery persons. At the same time, it has increased suitability for consumers as well. Five of India's leading women entrepreneurs took the stage at the Narendra Modi government's much-awaited Startup India event. Indian government is also taking numerous steps to build an environment which is suitable for startups, since small businesses can play vital role to develop and enhance Indian economy in the future. It is considered that Indian startups will contribute a lot in the growth of Indian economy, the amount of income and the huge number of jobs that can be created by facilitating startups. The market regulator Securities and Exchange Board of India (SEBI) has also relaxed some rules to facilitate the flow of funds from the market to the startups. India is rapidly growing in technical innovation. India has affirmed 2010-20 as the Decade of Innovation. The Government has stressed the necessity to articulate a policy to synergies science, technology and innovation and has also established the National Innovation Council. It is documented in reports that India is the 4th largest ecosystem in the World for Starts-Ups, after the US, the UK and Israel with a speedily evolving ecosystem, driven by an extremely young, diverse and inclusive entrepreneurial setting. According to the NASSCOM, approximately, 11,500 Start-ups will arise in the Country by 2020. These will create more than 2.5 lakh jobs, compared to the current 75,000 jobs. It is evaluated that start up India scheme is effective for Indian entrepreneurs. The scheme intends to push for Entrepreneurship in the country by providing soothing environment for the businesspersons.